I'm having difficulty understanding the timing of an ISR. I'm using Timer/Counter0 to both toggle OC0A output and generate an interrupt. The ISR toggles output pin D2 while a loop in main() toggles output pin D0. I'm using Atmel Studio 6.1 with an ATmega32U2 and looking at the output using a logic analyzer. When there is no interrupt, output pin D0 is toggled every 3 cpu clock cycles. The entire interrupt duration is 31 cpu clock cycles (5 cycles to get to the ISR and 26 cycles for the ISR). So far, so good. It matches what is expected from the data sheet. I have aligned the "out" instruction in the ISR with the transition of pin D2. The instruction begins with the falling edge of the cpu clock and the output is asserted on the rising edge of the clock. Edit: This is wrong! The instruction begins and ends with the rising edge of the clock. See this post. You can see that the interrupt duration stretches the low phase of pin D0 from the normal 3 cycles to 34 cycles, which agrees with the 31 cycles calculated for the interrupt. Two cycles are marked with a red "?". 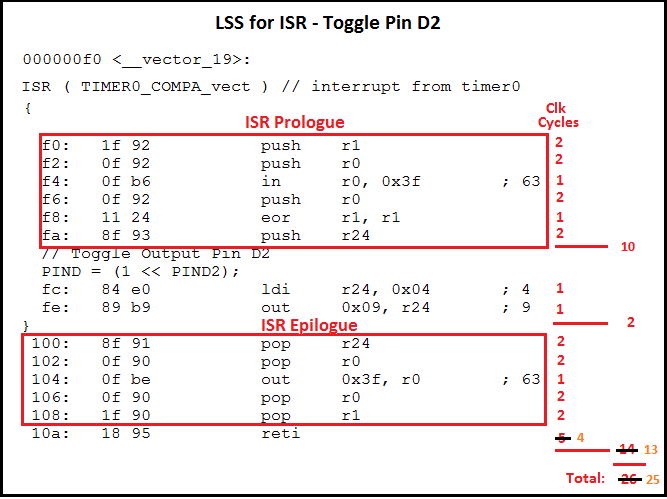 It appears that the two cycle rjmp instruction in main() is being divided by the ISR, even though the interrupt flag was asserted in the clock period prior to the out instruction. The rising edge of OC0A is coincident with the falling edge of pin D0. Again, aligning the "out" instruction with the falling edge of pin D2, there is also a gap of one cycle (marked with a red "?") after the rjmp and before the first cycle of the interrupt. Also, it appears that the last cycle of reti instruction in the ISR occurs at the same time as the "out" instruction in main(). It is as though the falling edge of D2 is one cycle late. And when compared to the start of the OUT instruction does the actual change in the pin value happen? I certainly don't know. If the pin voltage change for the 'out' instruction is shifted one or more clock cycles to the right (pipe lining?) then that would be true for both D2 and D0. This would be the equivalent of shifting everything shown below the trace window to the left. The problem is the number of clock cycles between the edge of D2 the the following edge of D0. This wouldn't change if the pin change is offset from the instruction for both 'out' instructions. Following that line of thought, the conundrum would vanish if the output was delayed one clock cycle for only the 'out' instruction in the ISR (which changes D2). Is that possible? The 'out' instruction in the ISR is followed by a 'pop' instruction while the 'out' instruction in the main() loop is followed by an 'rjmp' instruction. Does that make a difference as to when the pin voltage changes relative to the instruction? Which is of course a ridiculous assumption. Then when is the interrupt flag set in relation to when OC0A goes high? And when the interrupt flag goes high, how long before the interrupt mechanism recognizes it? If the interrupt flag goes high on the cycle just before a new opcode starts, does the interrupt happen before or after that opcode? (My guess would be after). I think that you simply have an erroneous assumption about ISR timing. You've done a lot of digging. Diagrams well annotated. Let's examine ISR sequence, from what I know. You can correct me where I go wrong. -- There are "wildcard" operations that affect this cycle counting. For example, CPU clock stopped for four cycles during EEPROM read. -- Interaction with other ISRs can "throw off" cycle counting with interrupt latency and such. -- But steady-state simple program such as shown, the above factors don't come into play and a more-or-less steady state operation should occur. -- Why "more-or-less"? What is the first thing that needs to happen? If an interrupt occurs during execution of a multi-cycle instruction, this instruction is completed before the interrupt is served. So the current instruction needs to be finished first. Are you synchronous with the ISR over time? I'd expect to sometimes fire during the OUT and sometimes during the RJMP and see some jitter. But you don't? -- 1-3 Finish current instruction (Or is that 0 to n?) In this example, just perhaps a one cycle difference so no big deal? So I'd say minimum of 8 cycles to get to the ISR. I suppose you could say that a one-cycle instruction takes 0 extra cycles. To me, I don't care in any of my apps about sub-cycle timing or exactly when the output pin goes high in relation to the AVR clock. After four clock cycles the program vector address for the actual interrupt handling routine is executed. During this four clock cycle period, the Program Counter is pushed onto the Stack. The vector is normally a jump to the interrupt routine, and this jump takes three clock cycles. If an interrupt occurs during execution of a multi-cycle instruction, this instruction is completed before the interrupt is served. Now I've lost track of the question. ;) But of no matter, after I challenged the basic assumption of 5 cycles plus ?. Unless that's how the AVR works. Challenge your assumptions. I'm not saying that that is how it works, only posing a hypothesis. If you assume that only the 'out' in the ISR is shifted to the left by one cpu clock cycle, everything falls into place. For both Figure 1 and Figure 2. When the interrupt flag is set can not be directly observed, only derived from the output on D2, calculating backwards. As I see it, the critical parameter is the number of clock cycles from the transition of D2 to the transition of D0. The problem is that the observed doesn't match the calculated. Something aint right! But what? So I'd say minimum of 8 cycles to get to the ISR. The interrupt execution response for all the enabled AVR interrupts is five clock cycles minimum. After five clock cycles the program vector address for the actual interrupt handling routine is executed. The calculated and the observed match. It takes 5 clock cycles before executing the first instruction in the ISR. How do you figure interrupt response should be 5 cycles? It is 4 cycles, plus the JMP in the vector table. JMP is three cycles. Some devices use an RJMP at two cycles. Ah, OK I see that the 32U2 has a 5 cycle response time. What does the .lss for the vector table show? This will starve main() completely, and will toggle PB0 at a rate equal exactly to the round-trip cycle cost of the ISR. -- Finish current instruction. Now, you tell me whether this is 0/1/2/3/... Does it in fact sometimes hit during the two-cycle instruction? Then you should be seeing some jitter. -- 5 cycles to service the interrupt, according to Joey. -- 3 cycles for (generic) JMP. 2 if RJMP is substituted in the vector table. In no case are the above going to add up to five. Or six. If you look at Figures 1 & 2 in my OP, you can see that pin D0 stays low for 34 clock cycles. When there is no interrupt, it stay low for 3 clock cycles. The difference is 31 clock cycles. The ISR is 26 clock cycles. 31-26=5. That's 5 cycles before executing the first instruction of the ISR. This agrees with the data sheet which I quoted in my post of 13 January at 11:48pm. If the interrupt lead-in is more than 5 cycles, how do you explain pin D0 staying low for the 34 clock cycles? The interrupt execution response for all the enabled AVR interrupts is five clock cycles minimum. After five clock cycles the program vector address for the actual interrupt handling routine is executed. During these five clock cycle period, the Program Counter is pushed onto the Stack. The vector is normally a jump to the interrupt routine, and this jump takes three clock cycles. You are still ignoring the clear statment that a 3-cycle RJMP follows the initial 5-cycle latency during which the PC is pushed onto the stack. If you were to account for that you would see in fact that your ISR is shorter than it possibly can be. I suspect a datasheet errata w.r.t. both interrupt response time and cycle cost of RET/RETI. The problem seems to be with the actual width of the program counter (PC). There are several references throughout the datasheet to the PC being 3 bytes wide. There are also references to it being 16-bits wide. However for a 32KB flash device like the ATmega32U2 the PC is only 16-bits (2 bytes) wide. For these devices, only two bytes are pushed onto the stack for CALL, two are popped from the stack by a RET/RETI, and only two are place on the stack when servicing an interrupt before the vector is executed. All of these operations take 4 cycles, not the 5 indicated in many places in the datasheet. Atmel is guilty of countless copy/paste datasheet errata. I believe this to be a shining example. The AVR Instruction Set Manual is clear on the cycle cost of all of these operations. Devices with a 16-bit PC have a cost of 4 cycles for these operations, while 22-bit PC devices have a cost of 5 cycles. Despite text in the datasheet to the contrary, the 32U2 must have a 16-bit PC. Think about it. On devices with more than 64 KB of flash, the RAMPX, RAMPY, RAMPZ, RAMPD, and EIND registers are required to fully access flash. The 32U2 has no such registers. Looking again at your .lss, the ISR cost is 25 cycles, not 26. The interrupt response time is 4 cycles, not 5. Add to that the 3 cycles for the JMP that is the vector to the ISR, and you've got a total of 32 cycles. If the vector is a 2-cycle RJMP (you still haven't answered that question), then you've got a total of 31 cycles. I urge you to run the code I suggested above to determine the real round-trip cycle cost of an ISR. Assuming the errata exists, the round-trip cycle cost of the ISR should be 15 cycles with a JMP vector, or 14 cycles with an RJMP vector. If there is not errata, you would see 17 with JMP, 16 with RJMP. Yeah but that says that after 5 the instruction at the vector is executed. That instruction is 2 cycles for an RJMP or 3 for a JMP so doesn't that make the total time to reach the entry of the ISR 7 or 8. The two cycles you seem to be "missing" are surely the time for RJMP in the vector table aren't they? (I know it's a 32K micro but these days AS6 defaults to -Wl,-relax so will be using RJMPs not JMPs in the vector table if the ISR code is in range). I'd have a bit more interest if OP tells the importance of this quest. That said, I saw the 5ns notation on the logic analyzer trace above. It might be indeed interesting to "analyze" a trivial ISR similar to the above, but also include a fast channel with the AVR clock. E.g. See where the output pin actually changes w.r.t. the clock. "Trivial" ISR is IMO "SBI PINX, " and "RETI" right in the vector table entry. Note that this will help to clear up the 34-5 and similar. Another area of interest to me is why OP is apparently seeing consistent results, and no jitter from "finishing current instruction". if OP tells the importance of this quest. My Â£5 on video generation (isn't it always when the navel fluff gets inspected this deeply?). This started the evening of January 1. I had a couple hours to kill and testing the ISR timing has been on my to-do list for over a year. Just curiosity. Mostly, I wanted to know how long it took to decrement a variable (byte, word, long, long long) but also how long it took to execute the first 'real' instruction. Interrupt response and duration. It was when the results didn't jive with what I expected that it became more of a challenge. I've spent far more time on this than I ever expected. In the OP I showed the .lss output for the ISR. I calculate a total of 26 clock cycles. That leaves 5 cycles for the lead-in. If in fact the lead-in (including the jmp in the vector table) is 8 cycles, where did I make a mistake? Again, it was the timing displayed by the logic analyzer that made me think the lead-in was only 5 clock cycles. I appreciate any insight any of you can provide. "Trivial" ISR is IMO "SBI PINX, " and "RETI" right in the vector table entry. If the vector is a 2-cycle RJMP (you still haven't answered that question), then you've got a total of 31 cycles. The program uses a 3 cycle jmp. The numbers still don't add up. If I can implement theusch's idea of using SBI in the vector table, that should clear up the reti timing. Even though I've been working with the AVR for a few years, I still suffer from habit of believing what's in the datasheet. :? From the LA image, the interrupt uses 13 clock cycles. 13-8=5. 5 clock cycles for the lead-in. It is required for the test. Yes, reti sets the I bit, but and AVR will execute at least one instruction after the I bit is set, before any pending interrupts are serviced. Without the sei, that instruction would be the next one in the interrupted code in main(). We want to starve main() altogether so that our observations are exclusively of the round-trip cycle cost of the ISR. Inserting an sei before the reti means that the 'one' instruction that gets executed is the reti, still part of the ISR. After which the next pending interrupt is immediately serviced without running any code from main(). The timer configuration (CTC mode with a prescaler of 1 and a resolution of 1) ensures that there is always a pending interrupt. You already know that the 'lead-in' as you're calling it includes the 3 cycles of the jmp instruction that is the vector. This would leave 2 cycles for the push of PC onto the stack, which the datasheet says takes 5 cycles. This doesn't agree with your LA capture. __asm__ __volatile__ ("call foo%=      \n"
This will add two instructions to the ISR, a call and a ret. How long does your LA say the ISR is now? 21 cycles? 22 cycles? 23 cycles? Something else? You could do the same thing to confirm how long a jmp (or any other instruction) really is. __asm__ __volatile__ ("call foo      \n"
Ah crap. Copy paste error, sorry. Label foo is in wrong place. So 21 cycles. That's 8 cycles more than without call/ret, suggesting that each of call and ret are 4 cycles. This is in conflict with what the datasheet has to say about it, but in keeping with what the AVR Instruction Set Manual tells us about devices with <= 64 KB flash. We've still got a discrepancy of 1 cycle somewhere. Try some of the other test programs suggested. Concoct your own. You can't test the PC => stack action performed by the interrupt servicing mechanism directly, but you can test the rest of them, many of them without an interrupt. ... you can infer the cycle cost of the PC => stack action of the interrupt. Although we haven't confirmed it directly, reti should also be 4 cycles. Can you think of a way to unambiguously prove it's cycle cost? __asm__ __volatile__ ("call foo%= \n\t"
We do seem to have established that the datasheet is at least partly in error. Just for kick, can you post the hex file for your 13-cycle test? Attached is the hex file for interrupt duration of 13 clock cycles. Hex file for interrupt duration of 13 clock cycles. Testing the timing of sbi, sei, jmp, call, reti. ;No Interrupts Used - Test timing of sbi, sei, jmp, call, and reti. So it looks like it takes 3 clock cycles from the start of the interrupt until the first instruction in the interrupt vector table is executed. The entry in the vector table is usually a jmp instruction to the ISR. The jmp instruction also uses 3 clock cycles, which results in the 6 cycle lead-in to the ISR. That is an interesting result, to say the least, but not surprising given the last dozen or so posts. I'm wondering how it can be that 2 bytes can be pushed onto the stack in 3 cycles. Perhaps it is related to the single-level instruction pipeline used by AVR. Remember that we've established the condition that the OCF1A flag gets set on every single tick of the system clock. If the instruction pipeline is interrupt-aware, this might explain the shortened PC=>stack operation, i.e. if it can get some kind of 'head start' with associated logic w.r.t pushing the PC onto the stack. Now we have an interrupt being generated every 14 cycles. Main meanwhile is able (if uninterrupted) to toggle PB0 every tick of the system clock. We still have the sei preceeding the reti, which has the potential to starve main completely if there is a pending interrupt. The theory is that if indeed the PC=>stack action takes only 3 cycles for a 'newly seen' interrupt condition, then main will nevertheless be able to squeeze an out instruction toggling PB0 between each invocation of the ISR (ignoring the rjmp at the end of 128 out instructions), which should also happen every 14 cycles. If however the interrupt response time for a 'just in time' interrupt condition is actually 4 cycles (as almost all documentation suggests [errata notwithstanding]), then main will be completely starved. After entry into the ISR the first time, PB0 would remain unchanging. ;Main toggles PD0 every tick of the system clock. However the test is still revealing. My error of 3 extra ticks in the timer resolution should result in 3 out instructions and 3 edges on PD0. I see 4 edges, suggesting the PC => stack action really does take only 3 cycles, even for a newly arrived interrupt. I'm pretty sure we'll still see evidence that the PC => stack is in fact 3 cycles. This raises the question of why this might be the case, when documentation (errata notwithstanding) says otherwise. It might be important to remember that we have been testing a synchronous timer interrupt. If we were to test with an asynchronous timer, or with an inherently asynchronous external interrupt source (INTn, PCINTn, ACI, etc. ), I wonder what me might find. Of course the timing of the external interrupt source would have to be carefully controlled. We'd probably have to make adjustments equivalent to small fractions of system clock cycle to reveal if and exactly where the synchronising logic 'kicks in', and whether or not that ever results in the advertised 4-cycle PC => stack action. I'm marginally satisfied that we've (you've) discovered an anomaly. I'd be interested in knowing what Atmel have to say on the subject. What I might have patience for is running the same tests you've already conducted on an ATtiny85, mostly because I'm equipped to fairly easily capture the relevant data. I don't have an LA, but I have a home-brew test rig that should do the trick. Can't promise when I'll get around to it. Are you kidding? This thread is great, reminds me of the days when we used to try to find out what the unused opcodes were in early MPUs. Great detective work guys. We should do more of this, so count me in on further trials and testing. I've been needing to replace my broken logic analyzer for a while now, this thread has given me the reason to do so. I realise this isn't a revelation. However to date the datasheet errata I've come across have generally been either ambiguities of wording, or copy/paste errors from other datasheets. This one if proven seems on the face of it to be rather more serious. So far only the 32U2 has been subjected to testing, but I can't think of a compelling reason why other AVR based on essentially the same core (read: most devices) would behave differently. Up to this point it (to me) has made sense that reads/writes to SRAM by whichever mechanism is used would take the same amount of time. On the mega core in question, that's 2 cycles. Whether an sts/lds, an st/ld, or a push/pop was used, we could count on 2-cycles-per-byte-accessed. Similarly, a call/ret would be 4 cycles each for the two-byte PC getting pushed/popped to/from the stack. Again, similarly, an interrupt/reti on the same device would be 4 cycles each. Of course the one wrinkle in this theory is what the the AVR Instruction Set Manual has to say about devices with a 22-bit PC. The extra cost for the additional byte involved in call/ret and interrupt/reti is advertised as only 1 cycle (rather than the 2 the one might expect) for a total cost of 5 cycles for these operations on devices with > 64 KB flash. Mind you, since the advertised cost of a 2-byte interrupt PC => stack action is 4 and seems in reality to be 3, I'm rather past the point of wanting to guess. My interest lies in determining whether other <= 64 KB flash devices exhibit as advertised PC => stack interrupt cycle cost, and also how any > 64 KB flash devices behave. Do they in fact take 5 cycles as advertised? 4 cycles? 6? Something else? It's really only curiosity at this point. I am not AtomicZombie, and I don't typically need to be concerned with single cycles for any real application. But I'm curious to learn what Atmel have to say w.r.t why the interrupt PC => stack takes a cycle less than seems reasonable. What is different about the interrupt mechanism that exempts it from what appear to be fairly immutable SRAM per-byte cycle-cost? I'm also open to criticism over the testing methodology. Is there something we're doing that is giving the false impression that the PC => stack action is taking only 3 cycles? Have the test results been incorrectly interpreted? Seems to be very clear that, under these specific circumstances, the 32U2 takes 3 cycles to puth the PC onto the stack and jump to the TIMER0 COMPA vector. Not 4 cycles as expected. And not 5 cycles as advertised in the 8/16/32U2 datasheet. Seems to be very clear that, under these specific circumstances, the 32U2 takes 3 cycles to put the PC onto the stack and jump to the TIMER0 COMPA vector. Not 4 cycles as expected. And not 5 cycles as advertised in the 8/16/32U2 datasheet. joeymorin, thanks for all your help. I was spinning my wheels going nowhere before. I appreciate all the time and effort that you put in to this. A hat-tip to theusch for suggesting putting the ISR in the vector table. You're right, it was a ridiculous assumption. 1) 3 clock cycles after the start of the interrupt, the instruction in the vector table executes. 2) If the instruction in the vector table is a jmp, the first instruction in the ISR executes 6 clock cycles after the interrupt starts, not 5 and not 8. 3) reti takes 4 clock cycles, not 5. This resolves all the problems that I encountered. The Universe is once again in balance. Yeehaa! ATtiny85 has an advertised interrupt PC => stack cost of 4 cycles. I've run a similar test to those conducted on the ATmega32U2. They show that the real cycle cost is 3. Again, this may be an artefact of the use of a synchronous timer interrupt, and asynchronous external interrupts might exhibit the advertised 4 cycle cost at least some of the time. It was a surprise to me because the datasheet for the ATmega32U2 lists reti as using 5 clock cycles. the datasheet for the ATmega32U2 lists reti as using 5 clock cycles. (people would probably have more respect for Atmel documentation if they actually took on board corrections given to them). The instruction begins with the falling edge of the cpu clock and the output is asserted on the rising edge of the clock. This doesn't affect results of our tests, but I wanted to set the record straight. Here is the Figure 1 modified to show the instructions beginning and ending on the rising edge of Clock. ... with some new tests thrown in as well. I know it's been more than 4 years, but just thought I'd report back that I (finally) ran similar tests on an m328p, and the results are the same. Interrupt response time (i.e. PC->stack) takes 3 cycles, not the 4 cycles claimed in the datasheet. Maybe it differs according to the size of the PC? Indeed it does. The mystery, however, is why it differs from the datasheet claim of 4 cycles for a 16-bit PC. I have no devices with a >16bit PC in order to test the theory that they will exhibit a 4-cycle interrupt response time v.s. the datasheet claim of 5 cycles. Interrupt response time (i.e. PC->stack) takes 3 cycles, not the 4 cycles claimed in the datasheet. How have you tested that? 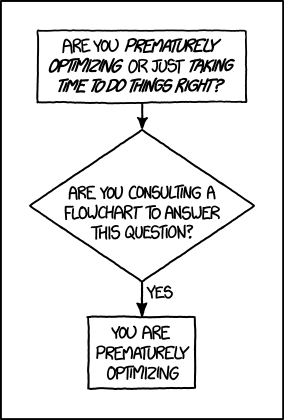 I would assume that "response time" != "time needed for vectoring". Apparently it is 3 cycles for the vectoring and 1 cycle of delay between the actual event and the start of the vectoring. I guess this delay cycle has something to do with the "always execute one more instruction before servicing a pending interrupt". And because the main code is executed during this delay cycle, you don't notice it with the kind of test the OP has done. That's been detailed in rather excruciating detail in this thread, four years ago. I used a similar method for my tests on the m328p today. Basically, I set up a timer to set an interrupt flag every CPU cycle, and constructed an ISR which toggles an I/O pin. Non-interrupt code is deliberately starved by inserting an SEI before the RETI in the ISR. The pin toggles at a rate equal to one cpu cycle less than expected. The cycle-length of all other instructions used in the ISR (OUT, SEI, RETI) have been verified, so the only possible conclusion is that the the frist step (where the PC is pushed onto the stack and execution is transferred to the appropriate vector) takes 1 cycles less than expected. I tested with a variety of other timer periods both less than, equal to, and greater than the expected and observed ISR round-trip time, with the non-interrupt tread toggling a different pin (if it doesn't get starved). In all cases, the evidence points to an interrupt response time of 3 cycles, not 4 as stated in the data sheet. Please read the (admittedly lengthy) thread for an understanding of how the testing was conducted. I'm open to the possibility that the test methodology is flawed in some way (e.g. making unwarranted assumptions), or that the interpretation of the test results are in error somehow. I have yet to see compelling examples of either. As mentioned 4 years ago, I'm curious to hear from Amtel/Microchip on this matter. That's been detailed in rather excruciating detail in this thread, four years ago. 1) A variable number of cycles before the jump to the vector is happening. 2) The fixed number of cycles the jump to the vector takes. Basically, I set up a timer to set an interrupt flag every CPU cycle, and constructed an ISR which toggles an I/O pin. Non-interrupt code is deliberately starved by inserting an SEI before the RETI in the ISR. they are spent within the ISR. Your test does NOT measure any response time at all. It only measures the time needed for the jump to the vector (part 2 of the response time). So obviously the (fixed) part 2 of the response time is 3 cycles. When the datasheet states that the minimum response time is 4 cycles, it basically says that part 1 is always at least 1 cycle. I do not know whether that is correct or not, but I do know I haven't seen a test here (*) that actually measures the minimum response time. (*): Again admitting I haven't read everything. But I probably will read it in more detail later in the day. I assume by your '1)' you mean a variable amount of time between when an event occurs and when the flag is set. In the case of the timer interrupt used in the tests, at least, that is not relevant. The flag is set every cpu cycle, so as soon as an invocation of the ISR has begun, the flag is once again set, so that when the ISR exits the conditions necessary for triggering the next invocation have already been established. There is no variable element. Neither are any instructions from main allowed to execute as is the norm. In these tests, main is completely starved of machine cycles by the insertion of an sei before the reti in the ISR. The interrupt response time normally refers to the sum of 1) the time to push the PC onto the stack and change the PC point to the appropriate vector, and 2) the time to execute the vector (usually a jmp or rjmp). With these tests, the ISR is placed directly in the vector table, obviating the jmp/rjmp, so the interrupt response time here means exclusively the PC->stack step. they are spent within the ISR. While its true that the normal '1-instruction' rule is effectively circumvented by the sei before the reti, the reti itself will never be anything other than a 4-cycle instruction, so this is a non-variable element. If you're suggesting that the hardware is able to 'get a head start' on the PC->stack step while the reti is underway, I see no support for that hypothesis. Where that the case, then a 3-, 2-, or 1-cycle instruction in its place should allow less time for the hardware to 'get a head start', and tests would show different times for the PC->stack step. These tests and others show this not to be the case. So the total round-trip time of the ISR should be 10 cycles, and the I/O pin toggled by the out could show a period of 20 cycles. Instead it shows a toggle rate of 18 cycles, with two identical 9-cycle half-periods. Other tests confirm with no doubt that out and sei are both 1-cycle instruction, and that reti is a 4-cycle instruction. The conclusion seems, inescapably, to be that PC->stack, PC=vector_table_entry takes 3 cycles. Not 4 as claimed. Aha. That is a novel interpretation of the 4-cycle interrupt response time claimed in the datasheet. In retrospect, it seems reasonable, since under 'normal' circumstances a pending interrupt would be subject to the '1-instruction' rule, that the minimum instruction length of 1-cycle be included in the the claimed 'four clock cycles minimum'. I find it somewhat misleading, however. A clearer passage in the datasheet would have been helpful. but I do know I haven't seen a test here (*) that actually measures the minimum response time. That is in fact >>precisely<< what these tests have been constructed to measure, and I believe they are in fact correctly doing so. However, the insight you've provided into an interpretation of the datasheet's claim of 'four clock cycles minimum' now including the normal '1-instruction' guarantee, with the minimum length of that instruction being 1 cycle, makes the math add up. I'm confident now that the PC->stack step is in fact only 3 cycles for a 16-bit PC, that the test methodology is sound, and that the test results have been correctly interpreted. I believe now that the error was in the interpretation of the datasheet. I assume by your '1)' you mean a variable amount of time between when an event occurs and when the flag is set. No, I mean the cycles between "flag is set" and "jump to the vector code starts to happen". And exactly because of that the test is inappropriate. Any Part 1 extra cycle is hidden within the ISR code. For me it is the total amount of time between the interrupt event and the start of the corresponding code execution, and I have never seen/heard a different definition. In case of your timer test the real response time is 3 cycles plus almost all cycles spent in the ISR and is therefore far away from being "minimal". That is not what these tests were meant to measure. On the contrary, it clearly reveals where the 4 cycles are spent. It is the datasheet which is 'inappropriate' by not making it clear that the 'four clock cycle minimum' includes the minimum 1-clock-cycle instruction being interrupted. That is in most cases non-deterministic, obviously. The tests were not meant to examine this. Rather, the interesting bit for me is the question: 'With a pending interrupt (no matter how far in the past the interrupt >>became<< pending) how long does it take to get to the vector table once the hardware is in a position to service the interrupt (i.e. I bit changes from 0 to 1, and the '1-instruction' has been executed)?' That's the only part I care about. For any given app, the method of WCE timing calculations will not change, but the the number I slot in to the PC->stack step will now correctly be 3. One cycle isn't much, but when you're counting cycles, it can make a difference. Unfortunately the images from the original thread were not transferred when Atmel introduced the new forum software. did not align correctly with the instructions. What was discovered was that the ISR vectoring took 3 cycles not 5 and RETI used 4 cycles not 5. Any cpu cycle used by the ISR is taken away from the main thread. The start of the ISR can be determined by aligning the change in D2 with the out instruction in the ISR. I came across something similar recently. I don't have time to dig out my notes right now but it came down to recent datasheets being wrong.